There were a great variety of presentations, although the majority were from Australian Universities, perhaps unsurprising given the event was organised and hosted by Victoria University. This was only the second H5P conference, the first being in Tromsø, Norway. It was such a great chance to meet most of the H5P core team including H5P Founder Svein-Tore Griff With (aka Falcon) pictured giving the opening keynote above, and Jelena M, Oliver Tacke, and Thomas Mars (with Stuart below). 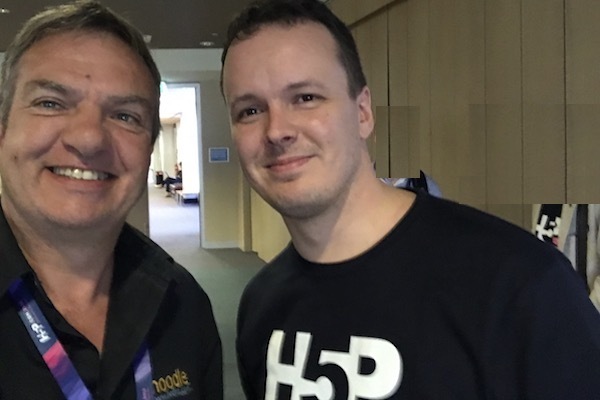 Many people, myself included, found the ‘developer hangout’ sessions very useful, providing an opportunity to chat and work with the H5P core team on anything you wanted! Given it’s ability to replace Flash, and allow for collaboration and sharing and reuse of HTML5 content, I am convinced that H5P is going to have a major effect, and become a central part of the e-learning ecosystem, within Moodle, D2L, Canvas, and other Learning Management Systems, and also outside the established LMS’s via WordPress and Drupal.